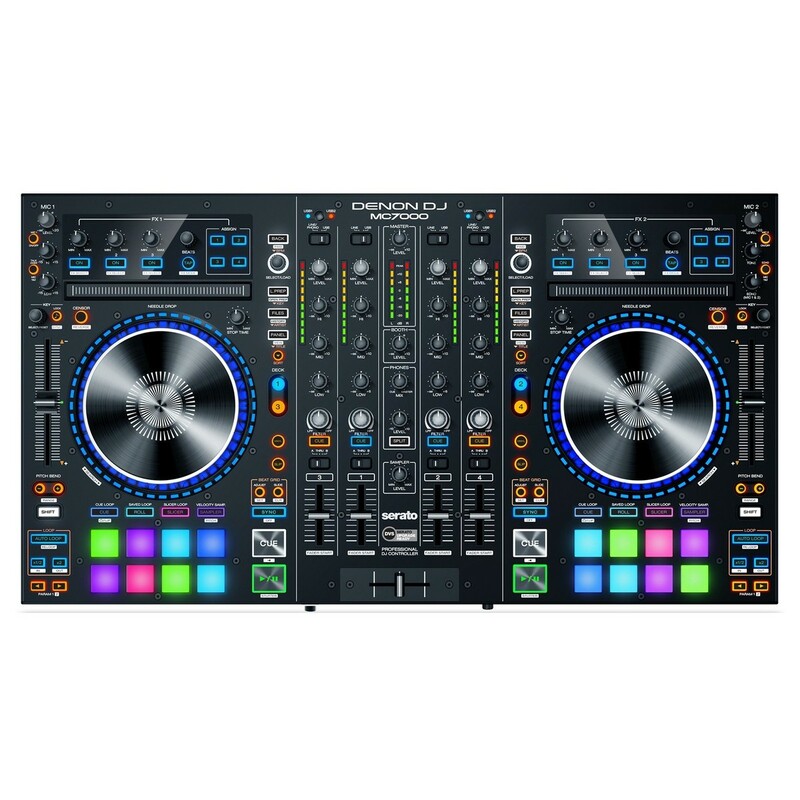 The Denon DJ MC7000 DJ Controller is a 4-channel DJ controller with built-in mixer featuring Dual USD Audio Interfaces plus 2 mic inputs with dedicated controls. The Denon MC7000 is packed with useful features for improving performance and more. The Solid 6-inch touch capacitive platters with tracking LED displays vital information on the LED display including track names and times. One of the most unique features is the dual USB audio interfaces which allows two DJs to play back to back in a truly seamless manner. The MC7000 has 16 velocity sensitive performance pads for adding a new dynamic to your set, allowing you to trigger everything from vocal samples to one-shots and more. 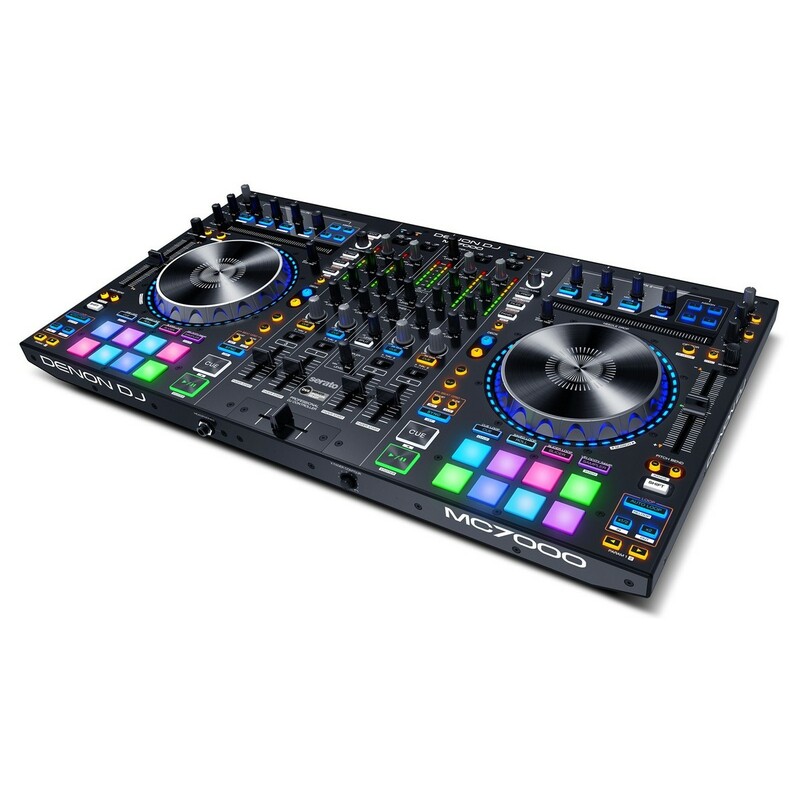 Additionally, the Denon MC7000 also comes complete with a full version of Serato DJ plus 3 creative expansion packs to get you started straight out of the box. The Denon MC7000 is built for performance thanks to its wide range of unique functions and controls that puts everything at your fingertips. The 4-channel configuration features a built-in mixer, making the Denon MC7000 a stand-alone controller, perfect for taking anywhere you go. The portable and lightweight construction makes it ideal as the go-to controller for any serious DJ. The Denon MC7000 was designed with the more seasoned DJ in mind, jam packed with features that give you everything you need to create a new dynamic in your sets. The 16 velocity-sensitive performance pads bring a new level to your sets, allowing you to trigger everything from vocal samples to drum kits for added performance value. Also included are new dedicated key matching and changing controls which brings a new level to your mixing, allowing you to match the pitch of the two songs you are playing for a seamless blend of both. The controller also features a dedicated FX section on either side, allowing you to trigger a range of effects including delay, reverb, flange and more. Dedicated loop controls have also been included for both platters allowing you to create and trigger loops of the audio on the fly. The robust yet portable design of the Denon MC7000 makes it perfect as the go-to controller for any intermediate/professional DJ, giving you everything you need in a compact and solid unit. One of the most unique features of the MC7000 is the dual USB audio interfaces which allow you to connect up to two computers at once for a truly expansive performance. 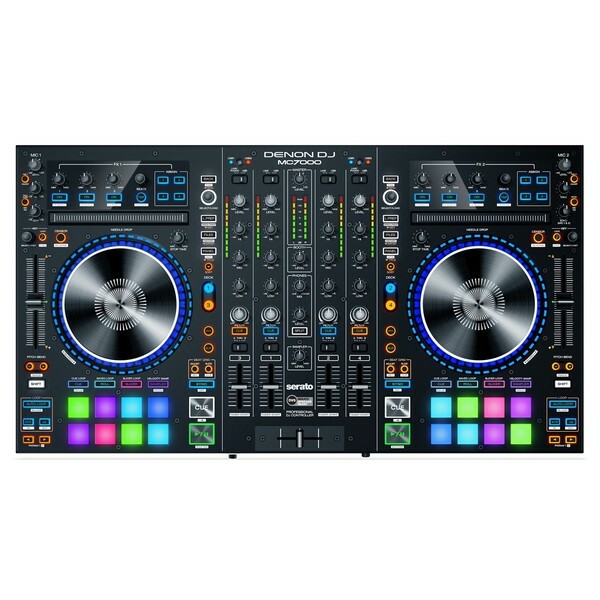 The dual audio interfaces allow two DJs to play together back to back, for a seamless and uninterrupted musical experience. The dual 6-inch platters features a touch-capacitive design with rotational LED displays, perfect for monitoring your audio’s information at any time. The dual LED displays will show information such as track name, track time, time remaining, time left, file format and more. 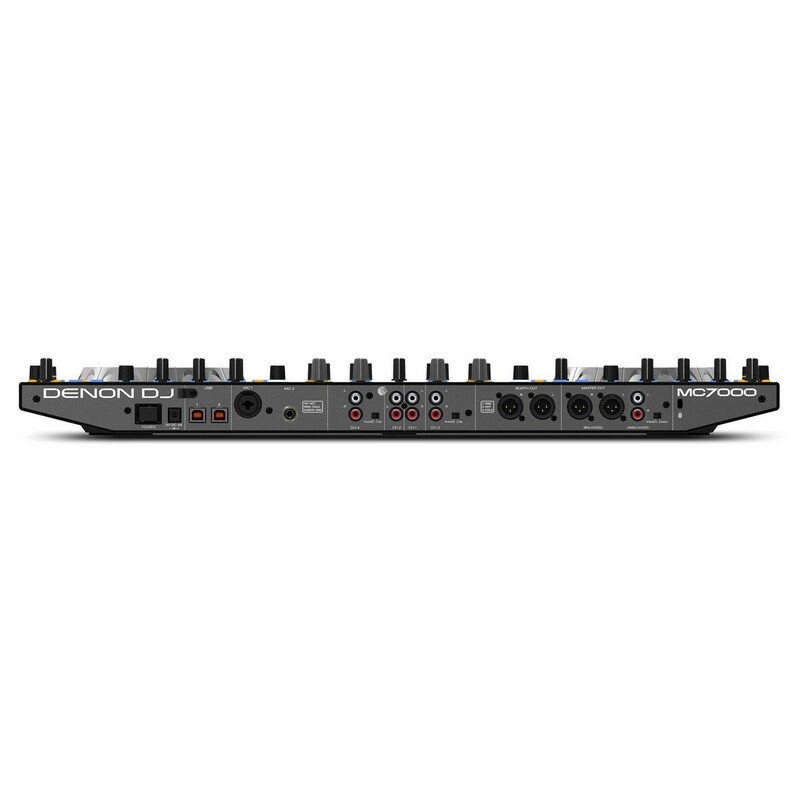 In addition to its primary mixing functionality, the MC7000 also features a range of digital and analog connectivity. 2 microphone inputs with dedicated controls have been included for versatile performance options, allowing you to incorporate a vocalist or use it yourself to address the crowd. The dedicated controls also allow you to dial in the volume with a two-band EQ for added control. XLR Booth and Master controls have also been included allowing you to connect the controller to sound systems and external speakers for performances as well dialing in the vocals with the controls. Additionally, the Denon MC7000 comes complete with a full version of Serato DJ plus 3 creative expansive packs (Ptich’n Time, Flip and Video) giving you a new range of controls and functions to expand your mixing capabilities. The MC7000 is also Serato DVS Upgrade ready, allowing you to cross between analog and digital mixing with the accuracy of legacy vinyl control. The MC7000 also features a multi-input mixer with both line and phono inputs for connecting to a range of different sources.